We have been hammering through rich former silver-towns and provincial villages for three and half days, spending just over one hour in San Miguel, time enough to drink a coffee in the Zocalo and admire the town’s astonishing, implausible neo-Gothic Cathedral. Built by an indigenous artist whose sole architectural training consisted of studying postcard images of French cathedrals, and who apparently communicated to his workers what he wanted by drawing in the dust, it’s a welcome relief from all the homogenous Latin American Baroque, and makes one wonder whether a native Mexican architecture couldn’t have developed along these half-insane lines. There’s a touch of Gaudi to it, but presumably by mad chance. 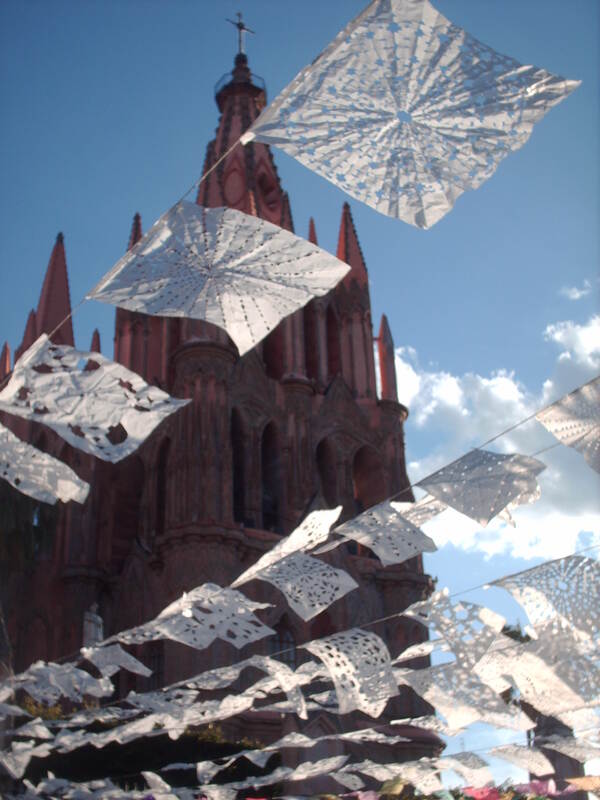 The light is low and brittle, and there are paper decorations spanning the Zocalo (today is the eve of Día de Los Muertos, November the 1st) which catch the late afternoon sun and cover half the church when seen from below. I take a lot of photographs. In between Xilitla and Queretaro stand the Sierra Gorda, and eight hours of switchback roads. I commandeered the back seat for some spectacular views of tree-covered mountains, and kept changing sides as we doubled back on ourselves at each turn, to keep the mountains and sheer drop in view. Chewed over the meanings of some Dylan songs I had thought I’d known well. San Luis Potosi is the richest and most beautiful of the Colonial towns so far. Then on to Querétaro, where at the entrance to the State Gobierno we are told that the Sala Juarez, where the man himself made some of the important and celebrated decisions of Mexican history, wouldn’t be re-opening after a lengthy restoration process until the following week, but that perhaps we should ask upstairs anyway. Confused but compliant we do so, and are enthusiastically given a personal guided tour of all the state rooms by the first of several loquacious and helpful inhabitants of this town, intensely aware of their nation’s history, and Querétaro’s crucial place within it. Likewise, the lady at the ticket desk of the Museo de Federico Silva gave us an extended explanation of the famous Mexican sculptor’s work, which is in a similarly monumental Aztec abstract style to the National Anthropology Museum. Use of Mesoamerican motifs scrambled by the non-figurative arrangement of shapes in space, and adorned with occasional touches of tribal paint. 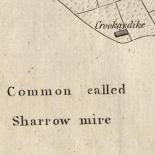 I do not know for sure whether this counts as indigenous abstract art, but I think so. 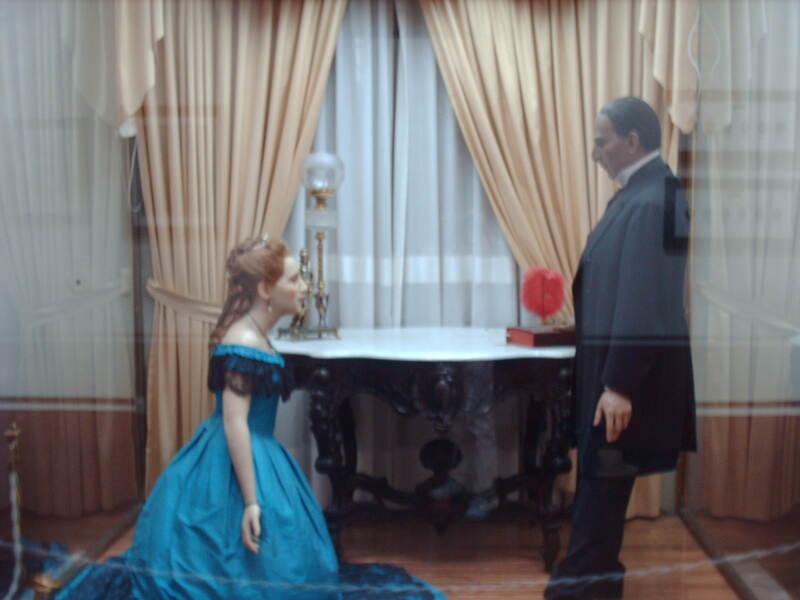 Inside the Sala Juarez itself there’s a strange wax work depicting Carlotta, late Emperor of Mexico Maximilian’s wife, begging Benito Juarez for her husband’s life. The expression on Juarez’s face is patriarchal, intended to convey, perhaps, self-abnegating refusal and the helplessness of the individual, however powerful, when set against historical and ideological forces (although for a contrary perspective on Juarez, see the excellent cartoon from Hark! A Vagrant). At first it seems strange that such an equivocal historical moment should be glorified in this way. Maximilian was bumbling and probably half-mad, but was interested in indigenous culture and nothing like as dictatorial as Diaz would prove to be. But, appointed by the French, Maximilian was a symbol, like this wax work: the white European on her knees, begging the indigenous Mexican statesman. The eccentric English surrealist and aristocrat Edward James lived by himself in the jungle near the small mountain town of Xilitla. 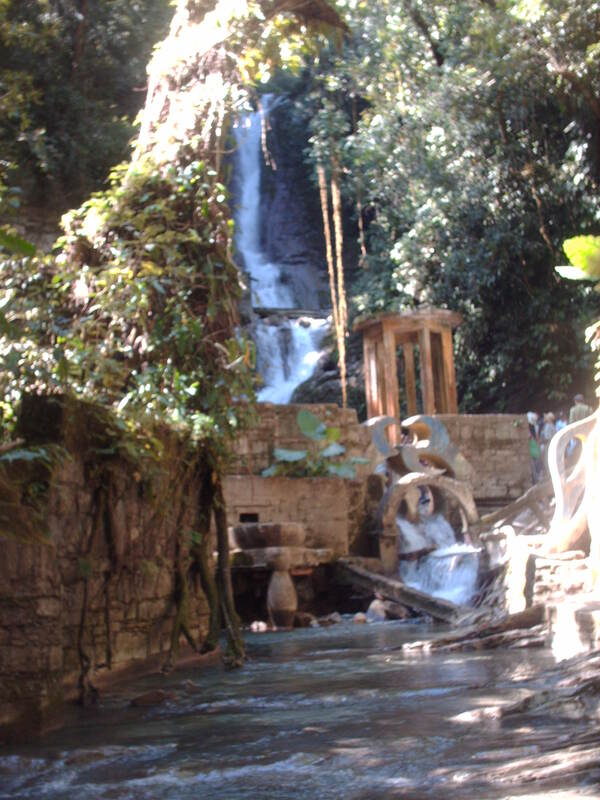 He built a garden – Las Pozas (‘The Pools’) – around nine natural fresh-water pools linked by a cascade. There are giant inconclusive concrete sculptures, staircases that halt ten feet up, enormous stone hands and many sheer and completely unmarked drops. Not a hint of health and safety; it’s refreshing to be allowed to make one’s own choices. It appears to be impossible to get from the first few pools, in which we bathed, to the ones further down by any of the paths, many of which seem to be going somewhere before terminating abruptly in a maze-like manner. The only way I could see was down a flat and steeply inclined slab of stone in the centre of one of the waterfalls. I like the idea of James leaving only a very difficult way to a good half of his garden, just as I like the minimal tourist trappings. There’s talk of developing this astonishing place into a proper tourist attraction: I hope it’s not anaesthetised, but sadly it’s hard to see how it won’t be. 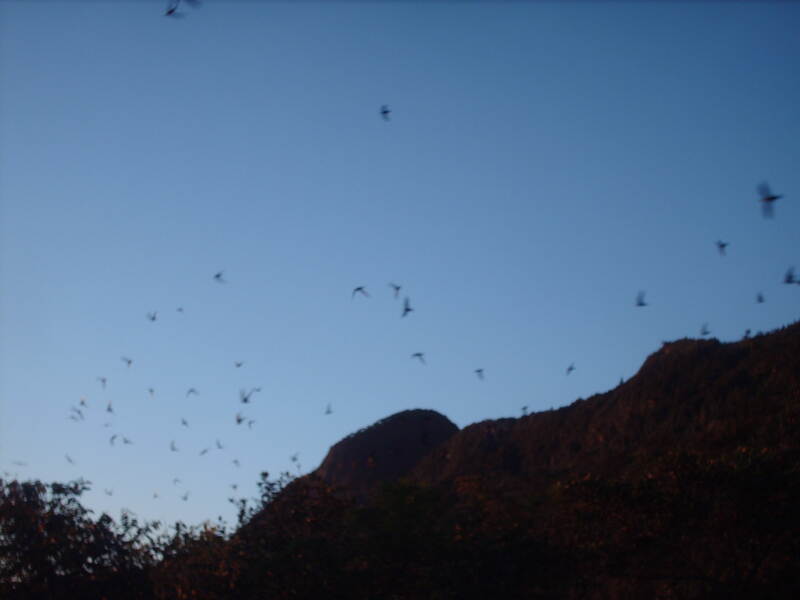 The only real reason for going to the village of Arquismon is its proximity to the Sotano de las Golondrinas, literally the ‘cellar of swallows.’ This is a misnomer, as this enormous abyss is actually home to about a million White-collared Swifts and some Green Parakeets. A four AM start is necessary in order to get through the temperate forest in time for daybreak, when the birds leave the cave to hunt for insects. They have to fly in spirals around the sides of the cave because of thermal currents; though the Parakeets gather in vegetation on the cave walls and fly out straight and low, squawking busily. 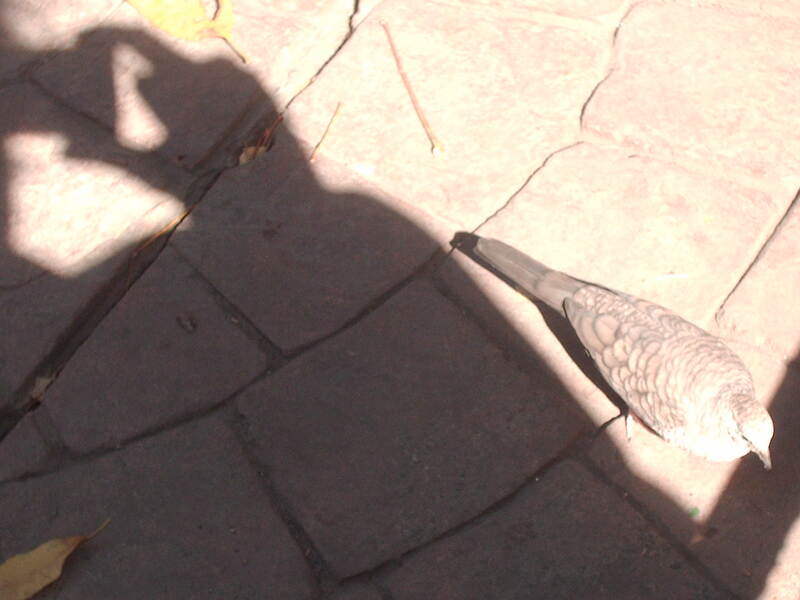 One grazed the top of my head with its wing-tip. On the subject of birds, ornithological mystery solved – by a Mexico City bird book found in a contemporary art exhibition about sustainability and natural variation – they are pleasingly known as the Inca Dove (‘Paloma Inca’). Mexico’s public rail network no longer exists, as the Mexican government discontinued subsidies in 2000, so bus it must be. The plane journey to Merida lasts about an hour. I tried working it out and anticipate taking a roundabout bus route will involve around 40 hours of motion, stopping in perhaps eight – ten places, including Oaxaca, and probably take around a fortnight. Brilliant, totally readable, beautiful style. So proud of you.. 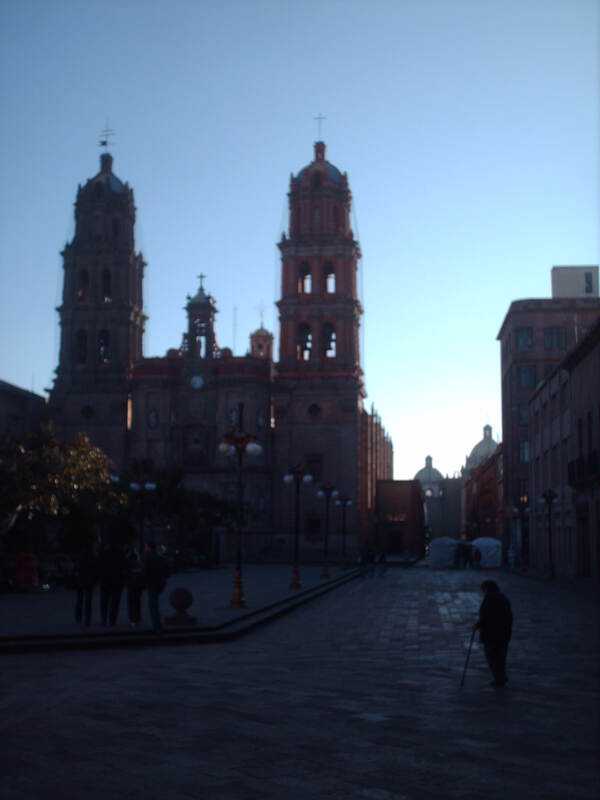 This entry was posted on November 16, 2010 by daneltro in Travel and tagged benito juarez, day of the dead, edward james, emperor maximilian, federico silva, las posas, queretaro, san luis potosi, san miguel de allende, sotano de las golandrinas, woody guthrie, xilitla.